The first ventricular assist devices (VADs) developed decades ago were meant to sideline the failing biological heart of a heart failure patient. These pumps were heavy, bulky devices that drew blood from the left ventricle through an intake valve and moved it into the aorta at as much as 10 litres per minute — the full output of a healthy heart. Held in the hand, the tiny, valveless Jarvik 2000® Ventricular Assist Device held is about the size of a C battery. Within its welded titanium shell sits a direct-current motor, a rotor supported by two ceramic bearings, and a single moving part: a small, spinning titanium impeller that pumps blood from the heart at up to 8.5 litres per minute. Rather than take over for the biological heart, the Jarvik 2000 augments the weakened heart’s blood output to help restore a normal blood flow throughout the body. By utilising the heart’s remaining strength, the Jarvik 2000 takes a simple, unobtrusive approach to circulatory support. Any muscle that gets too little exercise becomes “out of shape,” and the heart is no exception. The Jarvik 2000 allows the patient’s heart to continue to exercise as it recovers after surgery. The pump is designed to minimise patient reliance on mechanical support, avoid risk and redundancy in its function, and give the patient the best chances of recovery. 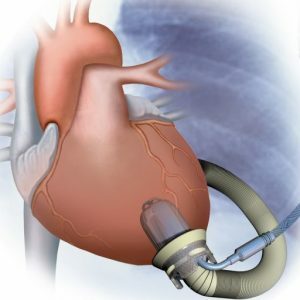 The small size of the Jarvik 2000® Ventricular Assist Device (VAD) gives it important advantages. The Jarvik 2000 is small enough to fit inside the left ventricle which is not the case with larger VADs. Larger VADs also require creation of a “pump pocket” which creates a site for discomfort and possible infection. The Jarvik 2000 does not require a pump pocket because of its small size. The whole unit sits inside the left ventricle and allows the ventricle to continue its normal function, filling with and ejecting blood. The small size of the Jarvik 2000 also makes it easy to implant and a viable treatment option for smaller adults and large children: in fact, it has been implanted successfully in patients as young as 11 years old. Jarvik Heart is also at work developing a smaller infant pump for use in infants and younger children. As an axial-flow pump optimized for its role supporting the heart, the Jarvik 2000 moves blood out of the heart at an impressive flow rate. With only one moving part, it is also totally silent. It is designed to be as “forgettable” as an implanted device can be — an ideal that drives the design of all of Jarvik Heart’s products. Since heart failure patients retain some function of the left ventricle, the Jarvik 2000 acts simply to increase the weakened ventricle’s output. In doing so, it allows the heart to circulate blood more efficiently, thus alleviating many of the symptoms and potential problems associated with heart failure, including failure of the kidneys, liver and lungs, which commonly occur in the final days or weeks of life. 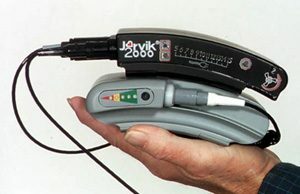 The Jarvik 2000® Ventricular Assist Device can be powered for 8-10 hours on a single rechargeable Lithium-ion battery pack that weighs less than two pounds. 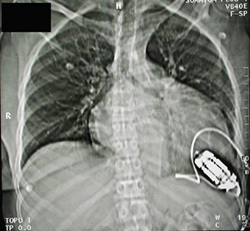 The pump draws power from the battery, worn externally, via a wire that exits the skin either through the abdominal wall or a connector mounted behind the ear. With so much life per portable battery, the Jarvik 2000 permits patients to roam tether-free longer than other VADs that consume more power. The durability of the external battery and controller mean that patients can take the device almost anywhere. The external equipment required by the Jarvik 2000 is also minimal: the total weight of the battery and controller is less than three pounds and can be carried comfortably in a shoulder bag or waist-belt. Batteries can be recharged at any wall outlet, and some patients carry several extra batteries, especially when traveling. The surgical procedure to implant any medical device is shaped partly by the design of the device and partly by the methods employed by the surgeons who implant it. The Jarvik 2000 FlowMaker® is designed to be easy to implant, and clinical experience has confirmed that it is. During surgery, the pump is placed inside the left ventricle through a circular incision in the heart wall and sewn into place. 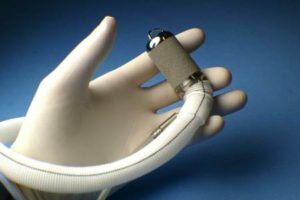 There the pump is secured with a polyester sewing cuff and joined via the outflow graft to the aorta, the main artery that carries blood to the rest of the body. The surgeon then routes the power cable either through the abdominal wall or under the skin to a pedestal mounted on the head behind the ear, depending on whether the pump is being implanted permanently or as a bridge to transplant.